Stephen Burgess, Oliver Burrows, Antoine Godin, Stephen Kinsella and Stephen Millard. How can large open economies deal with persistent imbalances now and into the future? This question became particularly pertinent in the Great Moderation where, despite stability in output and inflation, sectoral financial balances, both within and across countries, widened. In a recent Staff Working Paper, we developed a model of the UK economy to assess how economic and financial imbalances are likely to evolve over longer periods. Here, we show how we can use this model to examine the evolution of financial balances under different scenarios. We think models like this can form a useful addition to the suite of models called upon by policy-makers to help in their decision making. The ‘stock-flow consistent’ (SFC) approach we use in this model links decisions about real variables to credit creation in the financial sector and decisions about asset allocation among investors. This approach was developed in the 1980s and 1990s by James Tobin, and Wynne Godley and co-authors, and – as argued forcibly by Simon Wren-Lewis in this blog – grew out of a much older tradition of macroeconometric models – ‘policy models’ as Olivier Blanchard calls them here – based on aggregate (non-microfounded) relationships. These models emphasized the estimation of systems of equations, individually derived from economic theory. But SFC models treat finance and the real economy as equally fundamental, and emphasise explicit feed-back mechanisms between the two in a more comprehensive way than most macroeconometric models. The approach is best described in Godley and Lavoie and underpins the models of Barwell and Burrows and Caiani, Godin, Caverzasi, Gallegati, Kinsella and Stiglitz. SFC models incorporate the detailed accounting constraints typically found in systems of national accounts. They allow us to build a framework where every flow comes from somewhere in the economy and goes somewhere, and sectoral savings/borrowings and capital gains/losses add or subtract from stocks of wealth/debt. And they are capable of handling stock-flow relationships between multiple sectors and multiple real and financial assets. Our model has seven sectors: households, firms, government, banks, a central bank, insurance companies and pension funds (ICPFs), and the rest of the world. Figure 1 shows the money flows between these sectors in our model in a single period. The width of the arrows is proportionate to the quantity of the flow. On the left hand side, you have expenditure (Exp.) and on the right hand side you have income (Inc.). We distinguish between the sectoral current and capital accounts to highlight which flows lead to asset formation. 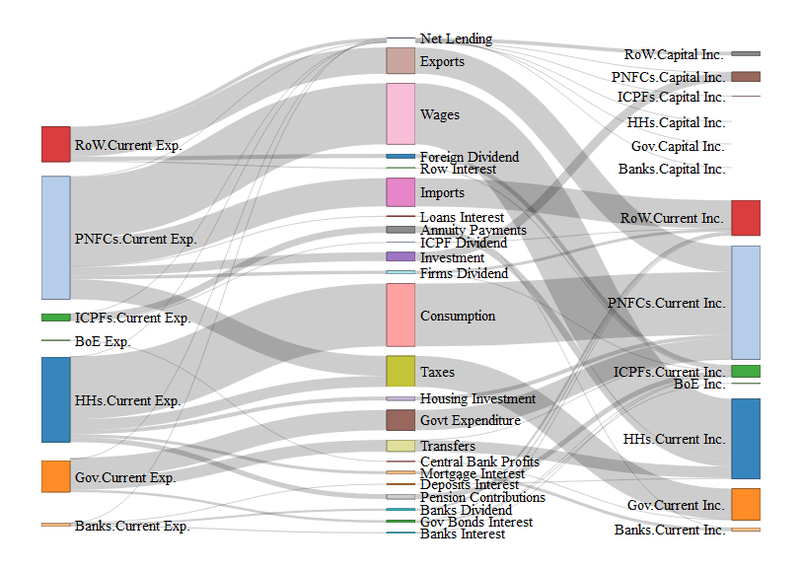 Figure 1: Expenditure and income flows between sectors in one period. Notes: BoE denotes Bank of England, HHs households, PNFCs Private Non-Financial Corporations, ICPFs Insurance Companies and Pension Funds, RoW Rest of the World and Gov Government. Although standard DSGE Models, such as the Bank of England’s COMPASS, are ‘stock-flow consistent’, SFC models do have some advantages over them. In particular, they can be used to analyse the evolution of gross positions of financial assets and liabilities and gross and net financial flows under different assumptions and they allow for feedbacks from financial asset positions to real economic decisions. Although, as pointed out by Simon Wren-Lewis in his blog, some DSGE models do allow for such feedbacks, the archetypal DSGE model of, say, Smets and Wouters does not; as a result, there is simply no need to track sectoral wealth positions. Against the benefits of SFC models, DSGE models have the advantage that the equations underpinning them are based more directly on the underlying problems facing individual economic agents and are more clearly linked to economic theory with the result that their parameters are ‘structural’ in the sense of being invariant to changes in policy or the time-series properties of the driving processes (ie, are ‘Lucas-critique proof’); they are simple enough that the mechanisms at work can be explained easily; they produce (at least when linearised) a VAR representation of the endogenous variables that should, in theory, be straightforward to take to the data; and techniques for estimating these models are well developed and understood. We view these modelling approaches as complements, rather than substitutes, and see the model described in this blog as being useful within the ‘suite of models’ used by policy-makers. The model is calibrated using data from 1998 Q1 to 2014 Q4. In the Working Paper, we use the model to produce a simple forecast for the next ten years. Clearly we do not expect such a forecast to be accurate at such long horizons, but it should allow us to assess whether or not the solution is explosive, and how imbalances might unwind. 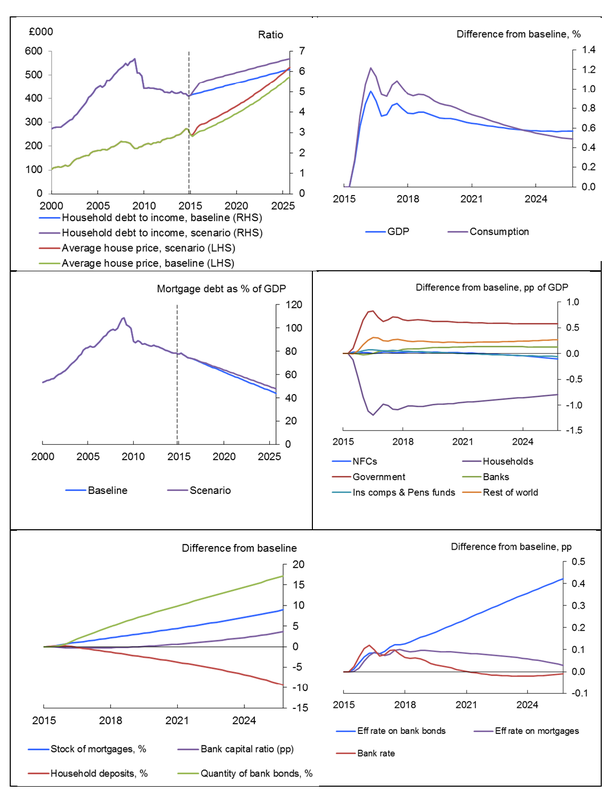 We also show how the model can be used to examine scenarios including increases in banks’ capital ratios, sudden stops, changes in investment, increases in house prices and fiscal expansions. Given the high degree of uncertainty around the estimated parameters of the model, the exercise is more about examining the directions of changes in our variables, and looking for unsustainable trends, rather than producing precise magnitudes for such changes. Here we’ll focus on just two scenarios. In the first scenario, we allow households’ debt-to-income ratio to rise. This is essentially an exogenous process in the model, though we could interpret this as being an increase in banks’ risk appetite, or perhaps a macroprudential policy loosening via a tool specific to the housing market. The results are shown in Figure 2. The immediate result of this shock is that house prices rise by 10% over the first year of the forecast. Since housing wealth appears in the consumption function of our model, the rise in house prices leads to an increase in consumption and in GDP. Another channel which operates is through housing investment, which is assumed to be sensitive to house prices. The house price rise leads to a stronger economy but also a rise in mortgage debt. Since the stock of houses only turns over slowly, this takes time, but after ten years the stock of mortgage debt is 8% higher (four percentage points of annual GDP). Looking at financial balances, household net lending is lower, as one would expect, and part of that is offset by a stronger fiscal position. But the current account is worse. On the income side, imports rise and, on the financial account side, overseas investors help to supply much of the finance to support the domestic credit expansion. Banks are unable to meet the higher demand for mortgages through household deposits (as households are dissaving), so they have to issue more bonds, many of which are purchased by overseas investors. Barwell and Burrows suggested that this overseas funding of the domestic ‘Customer Funding Gap’ was a feature of the pre-crisis period. The increased supply of bank bonds also leads to an increase in yields, which occurs alongside a rise in Bank rate. Domestic mortgage rates therefore rise. This increases households’ debt service costs (as does the rise in the stock of debt), further worsening their net lending position. . This also dampens demand for housing and leans against further rises in house prices. Arguably this channel had little effect in the run-up to the global financial crisis, as strong global demand for apparently safe assets helped banks fund domestic credit expansions in a number of countries by issuing debt securities. In a second scenario, we consider an increase of 10% in government spending. The results are shown in Figure 3. As firms’ incomes rise, this feeds through to wages, and consumption and investment also rise. Some of this feeds through to higher imports. The rise in GDP is roughly equal to the rise in government spending, though again we would suggest not putting too much emphasis on the precise magnitudes here given the large uncertainty surrounding the parameter estimates underpinning this result. Although the economy is in better shape and taxes pick up, in our model the expansion is not self-financing: the government runs a bigger deficit and its debt rises, though only modestly. Gilt prices fall and yields rise by about 50 basis points, increasing the government’s service costs and pushing the deficit up further. Given the parameterisation of our portfolio equations, we find that most of the extra stock of gilts is bought by overseas investors, rather than domestic ICPFs. This helps to fund the higher current account deficit caused by the rise in imports. The expansion in GDP leads the monetary policymaker to raise Bank rate, and the exchange rate falls gradually. 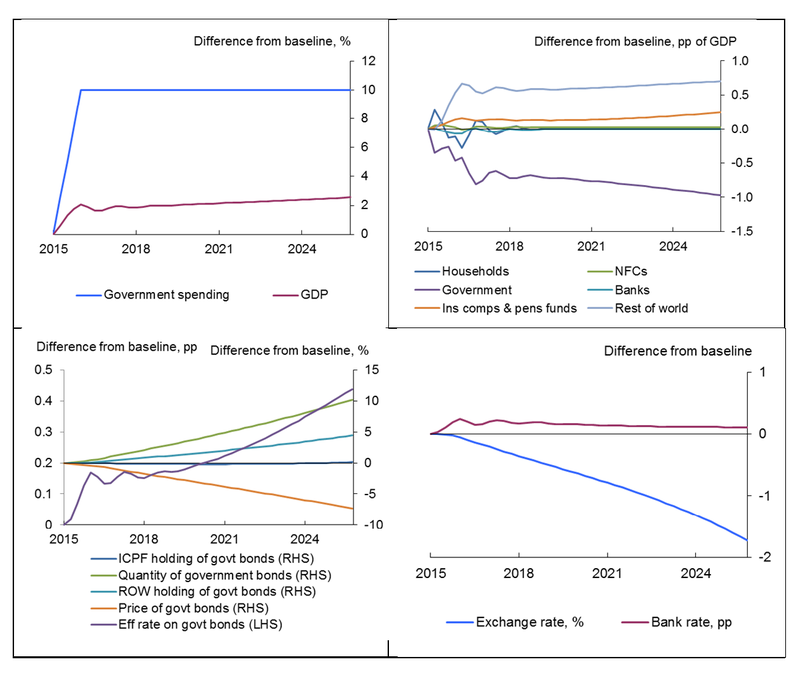 To conclude, we have used this model to examine how financial balances might evolve under different scenario, so illustrating how SFC models can form a useful part of policy-makers’ toolkits. Stephen Burgess works in the Bank’s Macro Financial Risks Division, Oliver Burrows works in the Bank’s Statistics and Regulatory Data Division, Antoine Godin is from Kingston University, Stephen Kinsella is from the University of Limerick and Stephen Millard works in the Bank’s Structural Economic Analysis Division. Next Post Does market liquidity risk affect Euro corporate bond returns more seriously in stress periods? Sector financial balance estimation and analysis was pioneered by the Bank of England in the early 1960s following the Radcliffe Report. I helped write the ‘Analysis of financial statistics’ in the earliest issues of the BoE Bulletin, 1962-64.